According to a recent Forecast International (FI) press release, the research firm projects that over the next decade, defense departments worldwide will invest some $30.6 billion on approximately 95 military satellites. The satellites to be developed and procured with this funding will range in size from large military satcoms, such as the Wideband Global Satcom and Advanced EHF, to the relatively small ELISA electronic intelligence satellite. As of July 1, 2008 the nations of the world had launched a total of 6,040 satellites and spacecraft since the first launch of Sputnik-1 on October 4, 1957. Of these, 2,748 can be considered as having purely military applications. This total excludes crewed missions that were used to undertake, amongst others, military experiments. It also excludes military scientific satellites and satellites that were primarily used for other purposes with military applications as a secondary objective. A graduate of the U.S. Air Force Academy with a bachelors degree in aeronautical engineering, General Mashikos career has encompassed a broad range of space and acquisition assignments. She was the Chief of the Programs Division in the Office of Special Projects, the executive officer to the Department of Defense Space Architect, and Program Manager for the Atlas V Program. She has also served as Director of the Evolved Expendable Launch Vehicle System Program, Vice Commander of Air Armament Center, and the Program Executive Officer for Environmental Satellites. When Robert Demers joined Americom Government Services (AGS), he brought with him decades of experience as; Vice President of government solutions for Inmarsat; general manager of global government services at ICO Global Communications, Inc., a Mobile Satellite Service (MSS) company; 22 years in the U.S. Army, serving in a variety of capacities including service as a combat helicopter pilot, an Aviation Unit Commander, and as Army liaison to the U.S. Senate. During one of his rare moments of availability, we caught up with him to retrieve some information regarding his work with AGC. Antenna Technology Communications Inc. is best known by all as ACTi and is headed up by one of the true personalities within our industry, Gary Hatch. As the CEO and President of the firm, Gary has also served as an international executive and engineer for Motorola and Telecommunications Inc./Liberty Media, as a board member for World Teleport Association (WTA), Society for Satellite Professionals (SSPI), Near Earth Investment Bankers, and Skyway Connect. We caught up with Gary to check with him on the government and military side of his successful business thats based in Chandler, Arizona. United States military use of satellite communications has grown exponentially over the past decade through extended utilization of military satellites as well as unprecedented expansion in the use of commercial satellite capacity. 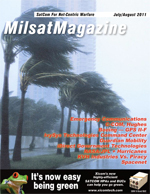 Leveraging what was a period of low utilization of commercial systems, the Department of Defense was able to work with commercial operators to reconfigure their systems and make satellites available where needed, to the point that currently some 80 percent of the satellite capacity used by the DoD is leased from commercial systems. The Space and Missile Systems Center is the birthplace and cradle of military space and the central hub of military space acquisition excellence. SMCs mission is to deliver unrivaled space and missile systems to the joint warfighter and our nation, producing innovative, affordable, and operationally effective space systems of separate subsystems that could carry out different missions. The MILSATCOM Systems Wing (MCSW) plans for, acquires, and sustains, space-enabled global communications to support the President, Secretary of Defense, and combat forces. MCSW is headquartered at Los Angeles Air Force Base (AFB) Space and Missiles System Center. MCSW consists of an integrated system of satellites, terminals and control stations, valued at more than U.S. $46 billion providing communications to aircraft, ships, mobile and fixed sites. It is a jointly manned wing which interfaces with Major Commands, Headquarters, United States Air Force, and Department of Defense agencies. The ability to learn allows mankind to adjust to situations of the most important kind, those of personal and business growth and, yes, even survival! Within the military, governmental, organizational and commercial worlds, the capability to adjust ones ideas based upon absorption of new information enables personal and professional development. Isnt that is what its all about?